By 1972, what we call classic rock was pretty much peaking . Stephen Stills along with the band and double-album he piloted and released that year both named “Manassas” brilliantly summed up the remarkable 1960s creative surge that revitalized rock’s roots and encouraged experimentation just when it was at its crest. 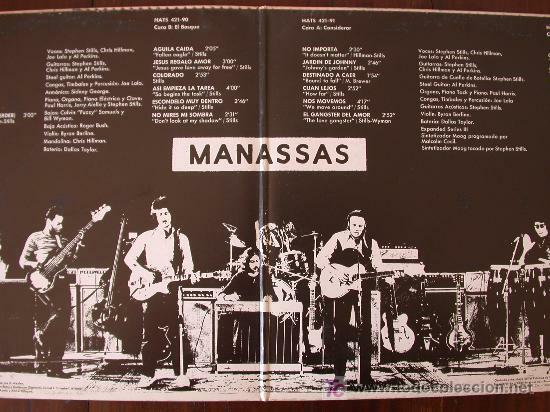 Manassas marked a critical comeback for Stills, calling it a “sprawling masterpiece” with Rolling Stone magazine saying it was “reassuring to know that Stills has some good music still inside him .Who knows? But an era was indeed ending. And nothing Stills has done since approaches the epic scale and artistic heights of Manassas. The four suites of music correspond to the four sides of the album’s original LP release , The Raven , The Wilderness, Consider, and Rock and Roll is Here To Stay. The songs are thematically grouped: part one (side one on the original vinyl release) is titled “The Raven” and is a composite of rock and Latin sounds that the group would often perform in full live. “The Wilderness” mainly centers on country and bluegrass with Chris Hillman and Al Perkins talents coming to the forefront , with the track “So Begins the Task” later covered by Stephens Stills old flame Judy Collins . Part three, “Consider” is largely folk and folk-rock. “Johnny’s Garden,” reportedly for the caretaker at Stills English manor house and not for Lennon as is often thought, is a particular highlight. Two other notables from the “Consider” section are “It Doesn’t Matter” (later redone with different lyrics by the song’s uncredited co-writer Rick Roberts on the first “Firefall album and “Move Around “ which features some of the first synthesizer used in a rock context. The closing section, titled “Rock & Roll Is Here to Stay,” is a rock and blues set with one of the landmarks of Manassas short life, the epic “The Treasure.” A sort of Zen-like meditation on love and “oneness,” enlivened by the band’s most inspired recorded playing it evolves into a bluesy groove washed in Stills fierce electric slide playing. A lot had changed since that surge began. Rock went from being a marginal sideshow for major record labels to a billion-dollar industry. Freewheeling entrepreneurs with “big ears” yielded to corporate types focused on market share and growing profits. “Supergroups” manufactured by producers and agents who headlined arena shows became the standard of success. The top-flight outfit Stephen Stills assembled in late 1971 and named for a bloody two-part Civil War battle (the album’s cover shot was taken on that battlefield) could nimbly navigate damn near every style rock was evolving– from blues “Jet Set” to bluegrass “Fallen Eagle” , country rock “Don’t Look At My Shadow” to Caribbean beats “Medley”, folk-rock “Johnny’s Garden” . Jamming out complex, textured arrangements in the studio, they successfully translated them to stages in Europe and the US. But Stills always felt that Manassas struggled for recognition because his handlers wanted him back in the huge selling rush that Crosby Stills and Nash (and sometimes Young) had generated. Whatever the reason, Manassas remains one of rock’s half-forgotten treasures. But it’s possibily the best album and band Stephen Stills ever helmed. Born in Texas, Stephen Stills was raised in Florida, Costa Rica, and the Panama Canal Zone as his military family rotated through duty stations. He absorbed all sorts of music along the way, and learned to play them on guitar, keyboards, bass, banjo, and assorted percussion instruments. The rootless kid found his mooring in sound. He beat up his family’s furniture until his dad finally got him drums to go with his drumsticks. After a week of college, he quit to be a musician. His scuffling path through the folk revival introduced him to dozens of players, like Richie Furay and Neil Young, who’d become his creative network. It also put him into play at the onset of rock’s 1960s creative surge. He was in Los Angeles trying to peddle his songs when he turned down a slot with the corporately manufactured Monkees (he recommended Peter Tork instead), and jumped headlong into the exploratory waves with his tempestuous Buffalo Springfield. The Buffalo Springfield surged into the national Top 40 charts with Stills’s brooding track “For What It’s Worth” . In the studio, on tracks as radically distinct as Kind Woman, Rock and Roll Woman, and Nowadays Clancy Can’t Even Sing , they probed the new ideas firing young musical imaginations from London to California. Live, the band crackled with guitar-hero firepower, when Stills and Young opened up in redoubtable jams. His songs were innovative, superbly crafted, stylistically diverse “Bluebird” is a stellar example of his fondness for complex structures. His lyrics could be elliptical or nakedly autobiographical; often infused with dark romance his confessional story-telling updated his beloved blues. Onstage, he hurled himself at the microphone, when he wasn’t prancing or dancing; he was so intense, his full-throated vocals seemed to come somehow from his entire body. The unstable chemistry and battling egos that fired the Springfield’s creative ambitions inevitably blew it apart. But the band had barely disintegrated before Stills was off solidifying his guitar-hero credentials on Super Session, with Al Kooper and Mike Bloomfield. On “Season Of The Witch”, Stills dialed up a distinctive voice on the wah-wah pedal Jimi Hendrix turned him onto, floating sweet nothings and yearnings tinged with acerbity. Thanks to his network, a series of incidents drew Crosby Stills and Nash together. Their 1969 debut release met with critical hosannas and gold-record status, and marked the dawn of that industry the supergroup, with high-powered handlers and big-ticket arena tours. Ironically, today it can sound like an almost-solo Stills album, so completely did his songwriting and talents he played nearly all the instruments dominate it. Graham Nash said, “Stephen had a vision, and David and I let him run with it.” Or maybe he just steamrolled over them. A year after the second album “Deja Vu” , what was now CSN&Y exploded, and all its members then released their solo albums. Stephen Stills went gold, He also scored a big hit “Love The One You’re With”and was the only album ever to feature both Eric Clapton guesting on “Go Back Home” and Jimi Hendrix on Old Times Good Times. Stills even describes himself as “aggressive,” “obnoxious,” and the like, all meaning he’s a control freak—an auteur, if you like. In those days, he was usually packing an enviable pocketful of new tunes. He could out-sing almost anyone and play one-man band if he wanted. You can see how he’d be a hard guy to face off with about creative issues. Yet he knew he needed feedback. He wanted to improvise with players whose ideas and chops stood up to his own. Then he could let jamming unleash creative interactions to enrich his ideas. That was how he worked during the Buffalo Springfield’s best days. Their bond dated back to 1960s LA, when Hillman—among the most catalytic figures in rock history—got Buffalo Springfield the gig as the Whisky A Go Go’s house band. That launched them on the road to stardom. Besides, Stills knew that Hillman was far more than a catalyst. After a whiz-kid run as a bluegrass mandolinist, he played innovative bass, doubled on guitar, sang lead and harmony, and co-wrote songs with the Byrds. When Roger McGuinn unceremoniously dumped his friend Gram Parsons after “Sweetheart Of The Rodeo” , Hillman left, and the Flying Burrito Brothers were born. Parsons and Hillman penned a few matchless songs that other composers would likely swap body parts for, like “Wheels” and “Sin City” . But the Grievous Angel was riding hard on the road to ruin; sloppy business dealings, erratic performances, and over-the-top drug use and boozing got him fired from his own group before the album “Burrito Deluxe” was released in early 1970. Hillman tried steering the band, but its personnel kept changing; the near-chaos made the Flying Burritos musically unpredictable and financially disastrous. So when Hillman and Stills again crossed paths in Cleveland, they both glimpsed opportunity. Stills’ bounteous talents and fierce competitive drive almost ensured he would overshadow nearly any setting he was in, but he was discouraged by his solo ventures. He needed a creative ally he respected, someone who’d push back but not combust or split. Chris Hillman, who may be rock history’s best-ever second in charge dealing with McGuinn and Parsons was secure enough in his own creativity to deliver. He would co-write two songs for the Manassas “Both Of Us” and “It Doesn’t Matter” , help Stills wrangle others into shape, and supply his subtle, pure-toned harmonies throughout. A few weeks later, Stills called Hillman and invited him down to Miami’s famed Criteria Studios, where engineer-producer Tom Dowd had produced the Derek and the Dominos’ monumental jam-fuelled “Layla” sessions the year before. As it happens, the producers for what would become Manassas worked on it too. From the shambling Burritos also came two key talents. Violinist Byron Berline was a bluegrass vet who’d clocked time with stars like Bill Monroe and Dillard and Clark. The Track “Fallen Eagle” , a breakneck bluegrass protest song against ranchers killing Americas endangered national symbol, puts his dazzling, keening fiddle and Hillman’s virtuoso mandolin in the forefront. Al Perkins learned to play Hawaiian steel guitar at nine, mastered the dobro and pedal steel, performed with country and western bands, then shifted gears to tour his native west Texas as a rock guitar slinger. He supports or duels with Stills on all his axes. On “Jesus Gave Love Away For Free”, his aching steel solos swell and sigh; on “Don’t Look At My Shadow” , they glide with glee. On “Jet Set” he plugs into effects to go grungy and deliver slashing, whiplash blues in Duane Allman fashion to counter Stills’ gurgling wah-wah. He plays both steel and guitar on “Song Of Love”. Perkins, Stills, and Hillman take their three guitar army acoustic for “Johnnys Garden”, where their loosely braided, ever-shifting lines gently nudge Stills‘ yearning vocal. The rest of the band came from Stills‘ solo albums and tours. Bassist Calvin “Fuzzy” Samuels brought the Caribbean feels Stills craved, as the burbling line on “Song of Love” demonstrates. But he could nail the bottom hard on blues-rockers like “Jet Set”. Keyboardist Paul Harris,was a session vet, he could play almost any style; with Hillman’s adept rhythm guitar, his keys became the session’s sonic glue. Latin percussionist Joe Lala co-founded Blues Image “Ride Captain Ride” and sang with gritty, soulful conviction. He vocally challenges Stills on the song “Cuban Bluegrass” , and delivers the pulsating Latin rhythms Stills adored . Drummer Dallas Taylor was Stills’ running buddy—and a wild card. He played on CSN first two albums and tours; they fired him because his substance abuse rivaled the Grievous Angel’s. But this bad boy had exactly what Stills wanted on drums. What was slated to be Stills‘ third solo album had morphed completely. The band’s chemistry clicked almost instantly, and its boundless energy and chops meshed with Stills‘ vision and discipline. A few weeks of jamming out arrangements fused the wildly diverse material and sounds into a sum greater than its parts. They came out of it as a fierce, tuned machine. No wonder Bill Wyman, who co-wrote “Love Gangster” with Stills and played bass for the track, said he’d leave the Stones to join Manassas. Hillman understood why: “We were always more of a band than people thought. Stills wouldn’t have been the same without us, that’s for sure. Manassas was the best band Stills ever played in. The album ends with a final stark jolt. “Blues Man” finds Stills alone with an acoustic guitar, He channels everything he ever absorbed from his revered blues masters into his gritty, anguished vocal and nimble fingerpicking to sketch a raw, painfully dark elegy for three of his friends. Jimi Hendrix, Al Wilson (Canned Heat), and Duane Allman had all recently died. They weren’t the only ones: Janis Joplin and Jim Morrison were among the others. Many were wondering if rock’s creative surge had run its course. Who knows? But an era was indeed ending. And nothing Stills has done since approaches the epic scale and artistic heights of Manassas.